Stovepipe is used to connect the stove to the chimney vent. 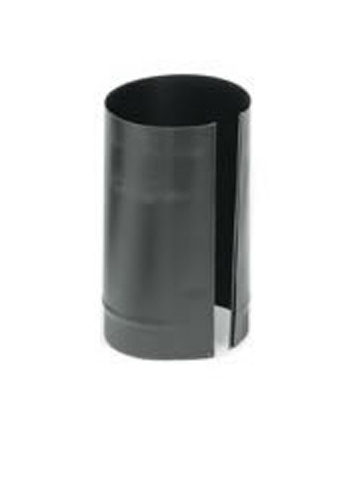 This pipe section is made of sturdy 24-gauge steel and comes in a sleek black finish to match other stovepipe components. . The piece has a diameter of 5" and comes in lengths of either 12" or 24" for your convenience when creating and installing your vent. The seams snap together easily and the piece is compatible with other Snap-Lock products. The stove pipe requires an 18" clearance to combustible materials when installed. Can this be used for a wood stove? If the wood stove may use 5" stovepipe, this may indeed be used. Can this be snapped on over any existing stove pipe, all the way up to the top using multiple ones? This could indeed be done if it was just to hide the stove pipe, but if there is damage to the pipe that you are covering with the snap lock, you would want to replace it completely.